The pieces to the Robert Morris Colonials playoff puzzle are coming together at the right time if last week’s performance in the first round of the Atlantic Hockey playoffs are any indication. Coming into the weekend on the heels of a six game winless streak, the Colonials seemed like a re-focused, well prepared team that dominated five on five play in winning two out of three versus the Bentley Falcons. The win pushes the Colonials into the Atlantic Hockey quarterfinals this weekend where for the first time since 2014, they will be on the road, facing a determined Holy Cross Crusader squad looking for it’s first trip to the semi-finals since 2011. A year ago, it was the same two teams battling for one of the four spots in Rochester, NY. The Colonials dispatched of the Crusaders in two games, although they had the home ice advantage as they did in a regular season series back in November where they came back from two-two goal deficits to earn a 5-5 tie and managed to take a 3-0 shutout the following night to earn a three point weekend. It would appear that the Colonials are up against a familiar foe, but can’t exactly depend on seeing the exact same team they saw a few months ago. 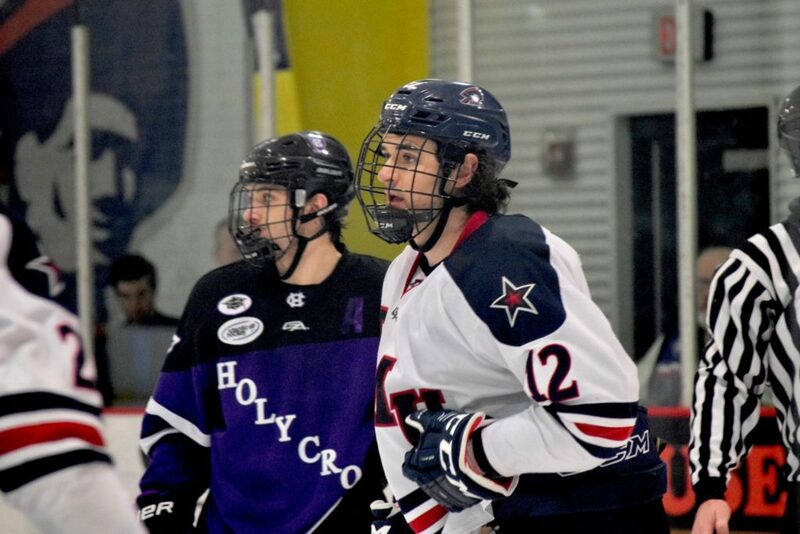 The Crusaders are ax experienced bunch led by the scoring of Scott Pooley’s 18 goals and 33 points and 2018 all-conference goaltender Paul Berrafato, the Crusaders stick to the system defensively so to speak, but have enough weapons to be much more than a one-dimensional team. A good start will be critical for the Colonials to impose their will and dictate more of the play. Last weekend’s series did point to something the Colonials will need to make the most of this weekend and in any future games, the top line of Brady Ferguson, Alex Tonge and Timmy Moore don’t have to do all the damage in terms of offensive output. Champions are able to find offense in many different ways and from different players and in their win over Bentley, the Colonials got playoff winning point production from the line of Daniel Mantenuto, who scored two of his four goals on the season last weekend, Luke Lynch and Matthrew Graham. The line combined for 8 points in the series. Also, skilled forward Michael Louria is now able to move between the bottom two lines to provide scoring punch as he did with an impressive wrap around goal against the Falcons.